Greg Oliver has been emerging as a new and prolific hockey book writer in the last couple of winters. Now he's got his young son writing hockey books, too. Here's a quip from the About The Author section: The life of author Greg Oliver and his wife Meredith changed dramatically once their son, Quinn, came along in November 2006 to mess up their Toronto home. Ever since he learned to read by age three, Quinn has wanted to write a book like his Dad. Well, here is the result. Dad and son have combined to create Duck with the Puck . I have been reading A LOT of children's books lately - hockey related and otherwise. Having two year old twin nephews allows you to enjoy such treasures in life. 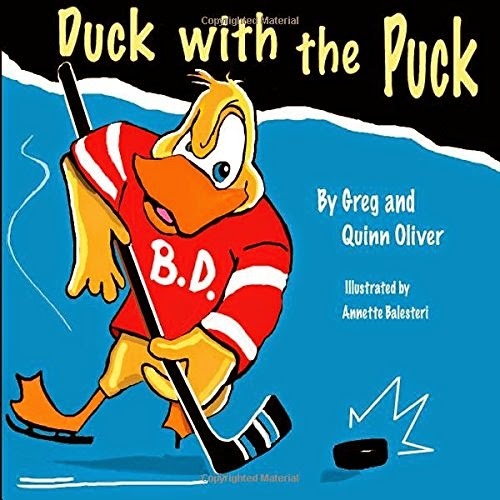 Duck With A Puck will definitely be in my nephews over-grown library the next time I see them. It's about a duck named B.D. who is happiest when winter arrives. Then he becomes the greatest hockey star in his wild world. He outskates raccoons, dekes snowmen and scores on bears. B.D. is a star not just of the pond but of pages. Kids are instantly drawn to him. Dad and son, with the happy stylings of illustrator Annette Balesteri, have come up with a wonderful book. I suspect this is not the last time we will hear from Quinn Oliver, either. We are so excited for Quinn and Greg! that now makes 3 out of 3 family members publishing books ... momma Meredith has also been a remarkable influence on little Quinn. Meredith began her writing career very young as well and continues to have that fire that her husband and she share with the young master. Keep on writing ... you all have a gift!